No matter what level of the game players are competing, one thing is key, they have to be playing regularly to make progress. Ulster scrumhalf Dave Shanahan is one of those players who has flourished this season from getting regular game time. 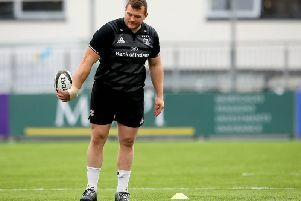 Having had to play behind Ruan Pienaar, Paul Marshall and more recently John Cooney, Shanahan has bided his time and while he has picked up some advice from his peers, the best way to learn is on the pitch in a game. Shanahan has played in 16 games this season, almost twice more than any previous year and that is something which has led him to finally show the form he has. “I like to think I’ve played okay when I’ve had to this year,” he said. “It’s been a great year for me, something I haven’t been used to, and in the past... I was looking at it the other day, it was either last year or the year before I had eight appearances. “But in eight appearances I’d only played 60 minutes, so you’re talking eight minutes a game. “When you’re doing that, you’re afraid to make mistakes because you’re like ‘I have eight minutes, I’d better not screw up’, whereas (this year) you’re actually getting a good bit of game-time. Ulster are due to face Southern Kings on Saturday evening and while they may sit in a lowly position in Conference B of the Guinness PRO14, Shanahan says they should not be underestimated. Ulster lie in third place, a point behind Benetton, with Scarlets four points behind, meaning there can no room for slip-ups in the race to make the play-offs and secure an automatic qualification place for next season’s European Champions Cup. On the Kings, Shanahan said: “Kings are second last in the table, and I don’t want to make a cliché of it, but they’re a seriously good team, seriously dangerous team. “Some of the performances they’ve put in this year, even when we played them earlier in the season, they made it really tough for us for the majority of the game. “We managed to get a couple of tries late to pull away from them, but they’re such a dangerous team. Shanahan knows what his role is over the coming weeks if Ulster are to make the play-offs. “It’s linking back to what I was saying before, I used to think if I’m not getting that much game-time then I need to stand out in the 10 minutes that I get - and at the same time not make mistakes - but I need to stand out too, which isn’t the way to be.